While 57,000 TSA employees are expected to work without pay during the government shutdown, Rep. Rodney Davis (R-Ill.), a government worker himself, thinks it's just dandy to travel first class. 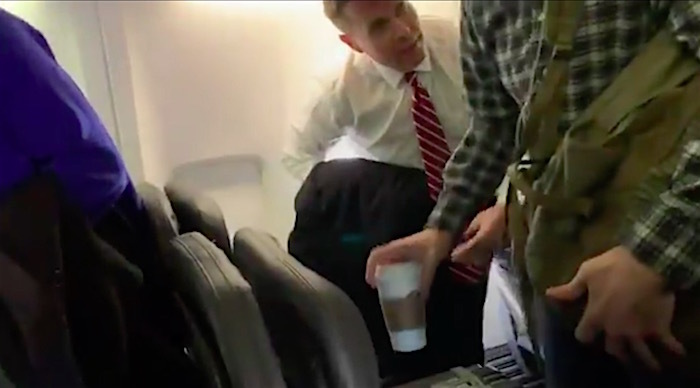 While sitting in his plush seat on a flight from Chicago to Washinton, D.C., a fellow traveler confronted him. “Congressman, do you think it’s appropriate to fly first class while 57 TSA agents aren’t being paid?”"
Davis is as silent as a church mouse. “Taking that as a yes...Taxpayers paid for this flight? Fair enough,” the passenger says. Apparently, Davis bought a coach ticket and upgraded to first class using frequent flier points. But the optics are ugly, to say the least. Via Huffington Post, who first obtained the video from the unidentified passenger.